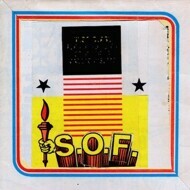 Soldiers Of Fortune are not so much of a supergroup, more a super collective. They started as an anti-band doing the absolute opposite of what you’d expect a band to do - nothing. It was the brainchild of sometime Interpol bassist Brad Truax. Mike Bones joined in and got the band to actually do something. The result is Early Risers. Notable contributors include Matt Sweeney of Chavez and...er Zwan, Stephen Malkmus, Cass McCombs and Ethan Miller of Howlin Rain/Comets On Fire.